Joe Spencer Gathered Traditions Collection Folk Art Dolls. Size: 9 x 7 x 38.5 inches. 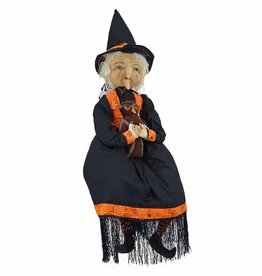 Mabel Witch Figurine 38.5 inches. Halloween Decorations, Decor and Accessories Collection by C & F Enterprises, Gallerie II Gathered Traditions Halloween Collection by Atrist Joe Spencer.